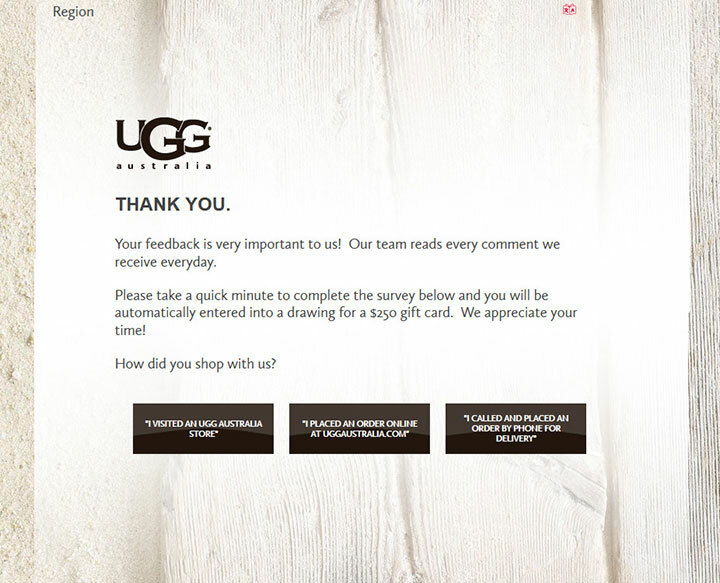 The UGG Guest Survey, found at www.UGGlistens.com, is an online questionnaire designed by UGG that rates customer appreciation. This is one way that companies can improve; they use the survey as a guide to what to fix. This survey is done online for your convenience. You matter to the company; this is why they are offering the survey. You can explain what happened on your visit and rest assured that they will look into any problems you may have had. This is their best way to improve the store. They listen to you and others and take those suggestions and problems to heart. They then work to make those changes needed to give you a better experience. You can also enter for a chance to win a gift card to UGG worth $250. Founded in 1978, UGG is a popular American shoe company who has grown to become a large part of popular culture. Although the brand proudly crafts footwear of almost all shapes, types and sizes, the prolific company is best known for its instantly recognizable sheepskin style boots for both men and women. This style of boot is often referred to as the UGG classic. The UGG brand is a division of Deckers Brands and has become recognized globally with a trademark in 130 countries. In 2003, Oprah named UGG as one of her world-famous favorite things during the holiday season. Have your recent UGG receipt that contains an invitation for the survey. Select how you shopped with the company, either in an Australian store, online at their website, or that you called and placed an order. Select where you are located or where you shopped (based on your answer to where you made your purchase). If you shopped in a store, enter the city of the store where you shopped and click Next. If you shopped anywhere else, proceed to step 5. Answer whether you would recommend them to a friend, how easy it was to order, if you used support, if you received your order properly, and more. Enter the drawing. Fill out the short form and follow the directions given.